Top Tower Hotel Kigali is a luxury hotel located on one of the most pleasant boulevard of Kigali in the booming business district of Kacyiru. Top Tower Hotel Kigali is ideal for business and leisure travellers travelling to Rwanda. Spacious rooms and suites with panoramic windows feature free wireless high speed internet, minibar, safe, large screen TV with international cable channels. 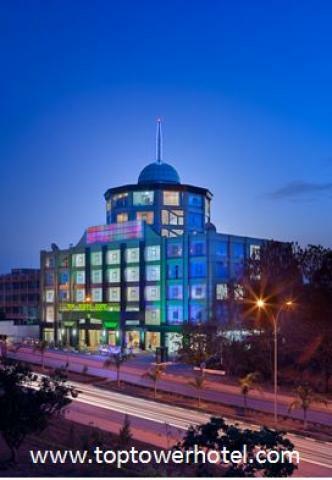 Top Tower Hotel Kigali is only 15 minutes from the airport and 15 minutes from the city centre. The Crystal View Bar located on the top floor of the hotel offers a truly stunning view over "One Thousand Hills". Guests can enjoy live gaming including Roulette, Blackjack and Slot Machines at the Casino Kigali located on the 2nd floor of the hotel.